Thankfully, it is farmer’s market season! That means a wide variety of fruits, vegetables, dairy, and meat products, including some unusual items just waiting to be discovered. There is something special about visiting an outdoor market in your community where you can connect with your neighbors as well as the men and women who grew and picked food for you that morning. Not only can you find the freshest produce, but children and adults alike can learn numerous things at the market. Realizing where your food comes from gives new appreciation for eating and snacking healthfully, and makes preparing meals fun. Farmers who love to speak with their customers and answer questions make great educators, so take advantage of their knowledge and willingness to share. Here are some questions to ask and topics to consider while browsing your local farmer’ market. Nutrition – Are these purple things really carrots? Why are they purple? There are many colorful varieties of carrots, potatoes, and cauliflower, maybe some varieties kids haven’t seen before. Talk about how different nutrients provide the color of the fruit or vegetable. For example, purple carrots contain the beta-carotene and vitamin A of your typical orange carrots, but also are rich in anthocyanins – the same nutrient that gives blueberries their beautiful color. 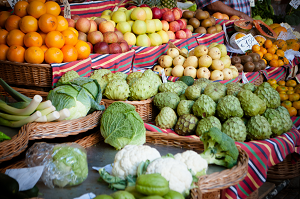 With so many varieties and options, it is easy to eat a nutritious rainbow of fruits and vegetables from the market. Science – How do bees make your honey? How long does it take to grow an apple? What does it mean to be organic? There are so many questions related to science to ask at the farmer’s market. Too many to list. From how plants are grown and fertilized, what the parts of plants are, to questions about seasonality and climate, the market is science in practice. Talk about the seasonality of certain fruits and vegetables and the climate they need to grow successfully. Kids will realize tomatoes take a long time to grow and prefer hot weather. Farmers might also be happy to share the requirements to grow organic food or how they deter insects and treat the soil to encourage healthy crops. Sustainably – How far away is your farm? What kind of farming practices do you use? Fresh produce that has traveled a far less distance than conventionally-sourced foods is one benefit of farmer’s markets. Talk with kids about how this business model cuts down on transportation costs and reduces pollution. Since the food typically is picked and purchased in the same day, within hours sometimes, there is often less waste. The products don’t sit on a shelf for days and wilt, plus shoppers often bring their own bags, cutting down on the need for plastic bags. This all affects sustainability. Many products at the market are also grown organically or using sustainable farming practices that reduce waste, cut down on the use of chemicals and pesticides, and promote the health of the soil – all good things for the earth! Community – What are your favorite things about farming or about coming to the farmer’s market? In an age of digital or sometimes aloof relationships, getting to know the farmers at the market can be rewarding. Visiting the same market regularly, seeing the same faces – both buying and selling, creates a sense of community and connection. Help kids understand the importance of the farmer’s market to the community and to making people’s lives better. Math – How many can I get for $5.00? With just $5.00 kids can explore the market on their own and determine how to make their dollars stretch. Kids can compare stands and use their math skills to hunt for the best deals. When they are ready to make a purchase, they should make sure they have enough money to buy and have received the proper amount of change. Kids can also weigh the produce to get a quick lesson in measurement. At Field Trip Factory, we are passionate about how experiential-learning programs strengthen education. We work hard to bring important lessons to life for students of all ages. This blog is an extension of those efforts. Full of tips on how to incorporate meaningful experiences into your curriculum, we also showcase how others across the US and Canada are using community-based learning to enhance their instruction. Check back often to keep up to date with the exciting things happening at Field Trip Factory and with our Partners! Field Trip Factory Copyright © 2014. All rights reserved.